One to Watch: Addison White | The Kids Beat | Kids VT - small people, big ideas! Addison White is used to having an audience. The 15-year-old fiddler performs with the Vermont Youth Orchestra and Young Tradition Vermont's Fiddleheads ensemble. She also regularly appears on one of the most visible stages in the state — Burlington's Church Street Marketplace. She busked there all summer. So during an interview at the University of Vermont's Davis Center, when a reporter asked her to describe the kind of music she plays, she offered to give an impromptu concert demonstrating the subtle differences between traditional Irish and Scottish dance tunes. Standing outside UVM's student center, she played reels on the fiddle while her mom looked on and college students strode by. "In Irish music, it's common to hear a bow triplet, which is where you flick the bow across the strings," she explained before launching into an Irish tune called "Salvation Reel." It was windy that afternoon, and her long blond hair whipped around her instrument. When it got caught in her bow, the 15-year-old faltered momentarily, then laughed it off and kept playing. Not all teenagers would exude such confidence. Addison has studied the violin since age 4. 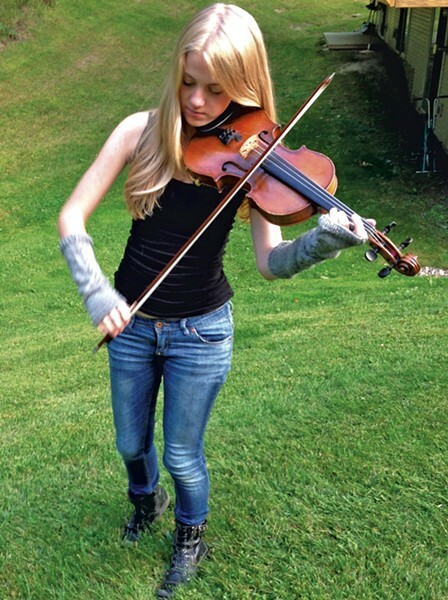 In sixth grade, she became interested in fiddling. The fiddle and the violin are the same instrument; what you call it depends on how you play it. Classical violin is, "more technical; it's Mozart and Bach," said Addison. Fiddling is more improvisational. Fiddlers play traditional American, Irish and Scottish songs, adding flourishes to make them their own. Addison loves the style of the music, but she also loves fiddling culture. "I've made so many friends playing the fiddle," she said. "There's this enormous community that comes along with fiddling. Sometimes I'll be busking on Church Street and someone will come up to me and say, 'I'm an Irish step dancer. Can you play a reel for me?' And then she'll dance while I play." Addison practices for about an hour every day. "It takes a lot of focus and patience," she said. Her focus now? Preparing for Young Tradition Vermont's trip to Ireland next spring. She has fond memories of a previous trip with the group, to Northumberland, England. On the first night, the teenage musicians got together with a local English ensemble for a jam session. "We all knew the same songs, even though we were from different places," Addison recalled. "That's when I realized that this music really brings us all together."